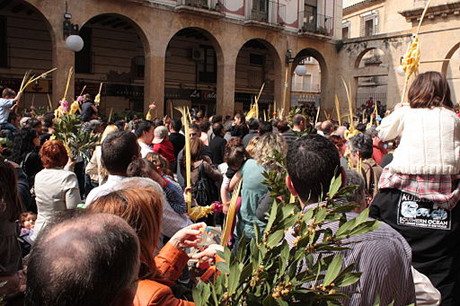 Palm/Passion Sunday is the beginning of Holy Week in the Christian calendar. Lent is over, but not finished. Everything is intensified starting today. The color may change from “penitent purple” to “blood red,” a reminder of the suffering and death of Jesus. During this week, the baptized walk hand in hand with those preparing for baptism as we face together the conflict, injustice, pain, suffering, death, and grief leading to and surrounding the crucifixion and death of Jesus. 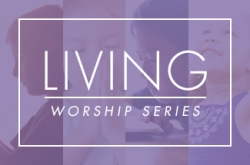 Worship today brings two liturgies together. The first is a processional liturgy (Entrance) to or into the worship space. It recalls the entry of Jesus into Jerusalem. The second is the main liturgy (Word and Response, Communion, and Sending Forth) in which we hear the whole story of Jesus’ last night with his disciples, his betrayal, arrest, trial and execution on a Roman crucifix. Today’s ritual recapitulates and anticipates the whole journey of readings and actions of the week to come. As you plan for worship today, remember that today’s Gospel reading of the passion of Jesus is the longest you may experience this year, especially if you do not offer a traditional Good Friday service that includes the reading of the entire Passion from John’s Gospel. Read it well, read it interactively, and strongly consider not offering a sermon at all, but rather an extended time for silent reflection after the reading leading into a celebration of Holy Communion in a solemn (though not funereal!) key. If there is any day in the year to use Word and Table IV, this is it. If you are not used to this form of the service, be sure to rehearse it with your musicians and a few others so you are able to lead it with dignity and grace, not stumbling over the words or the flow of this very different ritual. If you have not already done so, plan now for a complete celebration of the week, including services for Maundy Thursday, Good Friday, and The Great Vigil (see BOW 343-376 for resources, descriptions and service orders, and the link above for thorough instructions and suggestions for The Great Vigil). Readings for each day are available on the Discipleship Ministries worship website (click on April at the top of the list, and scroll down slightly). If you do not plan to gather for services in your worship space, consider organizing smaller gatherings at homes throughout this week (especially Monday-Wednesday) using these texts as guides for your prayer and reflection. And once again, I will offer a Holy Saturday service via Twitter at 10 AM ET. Watch for it at #holysat. The Festival of God’s Creation in 2014 falls on Easter Sunday (April 20). You are encouraged always to include the earth and care for the earth in your congregation’s weekly intercessions (if not, start adding that now! ), and of course on this day as well. If, during Lent, you have encouraged folks to reduce their energy consumption, today may also be an occasion for folks to share testimonies or simply place something in the offering plate indicating the results of their efforts to save energy. The resurrection of our Lord should be the primary focus of your celebration this day regardless of any other denominational focus. So while you may include recognition of the denominational day in worship, keep the resurrection of our Lord front and center, and consider offering other commemorations for the day at a time other than the worship hour. As you plan beyond Easter Sunday, remember that Easter Season (or Eastertide) lasts a full eight Sundays, from the Easter Vigil (April 19 after sunset) through the celebration of Pentecost (June 8). This is seven Sundays to celebrate and teach the stories of Christ after his Resurrection, through his Ascension (May 29 is Ascension Day, but the readings and celebration may be transferred to Easter 7 on June 1) and the coming of the Spirit at the Day of Pentecost. While the purpose of Lent is to prepare persons for baptism and help the baptized reaffirm their own baptismal commitments, the purpose of Eastertide historically is to help the baptized understand the mystery of the resurrection (mystagogy) as they discern their gifts and claim or reclaim their ministries in the world in the name and power of the Risen Lord. You may find Keeping Easter Season in Year A helpful as you are planning for this season. See the texts, artwork and Revised Common Lectionary Prayers for this service are available at the Vanderbilt Divinity Library, Liturgy of the Palms and Liturgy of the Passion. Matthew's narrative of Jesus' entry into Jerusalem. The Palm Sunday processional is an invitation to embodied and kinetic worship. The reading from Matthew's Gospel includes two cues for "props" for the processional: branches and cloaks. Whether you use "palms" (strip type or leafy) or other "branches," note what the gospel reading invites you to do with them. They are not waved, but placed down in front of Jesus like a "red carpet" or an aisle runner (as in weddings). We do not recommend using coats (they're not flat enough and could easily cause folks to trip and fall! ), but you may consider making and using a few simple overgarments — a large piece of cloth with an opening for the head — that some in the procession could wear then remove to place carefully on the ground for the leaders of the procession (worship leaders and acolytes) to walk on. Note: If you do this procession this way, following the pattern of the Scripture, be sure to provide for time and people to “clear the path,” removing whatever “branches” and “cloaks” to avoid any safety hazards! OR, simply do the entire processional outdoors, leading up to the entry to the worship space rather than in the worship space itself. If Matthew gives us cues about props, Psalm 118 gives us cues about language to use during processional. Here is a reconstruction of the psalm based on the New Revised Standard Version and the verses in our psalter with parts added. This reconstruction assumes that the lay leader is outside with the people, while the pastor/pastors are just inside the church or sanctuary. Lay Leader: Open to me the gates of righteousness, that I may enter through them and give thanks to the Lord. Pastor: This is the gate of the Lord; the righteous shall enter through it. Lay Leader: I thank you that you have answered me and have become my salvation. The stone that the builders rejected has become the cornerstone. People: This is the Lord's doing. It is marvelous in our eyes! Pastor: Save us, we beseech you, O Lord! O Lord, we beseech you, give us success! People: Blessed is the one who comes in the name of the Lord! We bless you from the house of the Lord. Lay Leader (facing the people): The Lord is God, and God has given us light. Bind the festal procession with branches up to the altar. (Any remaining branches or palm leaves are placed at this time to complete the pathway to the Lord’s table or the entry, if you do this entirely outdoors.). People: God’s steadfast love endures for ever! Here, the last verse of the hymn is sung. Then the service of Word and Table begins with a greeting and opening prayer, such as that in The United Methodist Book of Worship, p. 339. See the texts at the Vanderbilt Divinity Library, Liturgy of the Passion. Isaiah voices the way God's servant will move forward in hope. A psalm of trust from one in the throes of intense suffering. Sing using a minor key or otherwise contemplative setting. Matthew 26:14-27:66 or Matthew 27:11-54. Matthew's Passion narrative in a fuller and a shorter version. Strongly consider a participatory reading of the entire text. The consistent theme of the imagery in the Passion Sunday readings is intense human suffering. From Isaiah, we see the suffering brought upon one who seeks to teach truth, but is reviled, rejected, and persecuted for so doing. In the Psalm, we enter into the world of a person whose physical suffering is matched by the emotional pain of being forgotten, abandoned, left for dead, or intentionally shunned by others. Philippians and Matthew place before us the suffering of Jesus as he faced and then experienced crucifixion. This is not a day to spend any significant time explaining the specifics of Roman crucifixion practices — neither is Good Friday, for that matter. Instead, this is a day to help the congregation see and experience the world as those who are suffering intensely see and experience it — not so much by looking at their eyes, as through them. This is a day to hear and understand deeply the sounds and voices and stories of suffering that are still with us, all around us, so that our prayers and our worship are not so much for the suffering ones (in pity or concern) as in solidarity with them (in radical hope before God). Simply listen. Do not spend time in your planning team for this service, or any of the services of Holy Week, trying to “enhance” the texts or raise the emotional intensity. The texts this day do that well enough. Read them well, and trust them to do what is needed as they are read. In so listening, singing and praying, your worshiping community will be able to enter more deeply into the suffering of Jesus with us and for us. If using Word and Table IV is too much of a hurdle for you or your congregation today, consider instead using the “Great Thanksgiving for Later in Lent” in The United Methodist Book of Worship. It includes wording taken directly from the reading from Philippians for this day. You may also want to consider using the section of the ancient prayer quoted above (from The Apostolic Tradition, ca. 215) after the words "Holy are you… and prior to "By the baptism of his suffering, death, and resurrection." Context in the Christian year. On this Sunday that begins Holy Week, we come to the core and mystery of our salvation. This Sunday and Easter Sunday are the most evangelical Sundays of the year. The liturgy for this day is ancient and comes as a wonderful gift. It is so powerful that it draws all into its story — not as distant observers, but as people fully present for the events that we call the Paschal Mystery. Even if there has been a death in the congregation or a national tragedy or a breath of some good news, stay with the ritual of this day. It will embrace us in whatever has happened and transform us with the love of God enacted in the dramatic events in Jerusalem two millennia ago. Colors and Clothing. The Book of Worship indicates purple or red for this day and through Holy Thursday. Increasingly red or crimson has become the preferred color ecumenically. On Good Friday, there is simply no color, no paraments, no decorations of any kind. (Black is not a liturgical color). And since the service does not involve the sacraments, clergy may choose to wear no stole, or perhaps to wear it under the alb or robe. The United Methodist Book of Worship, "A Service of Lessons and Hymns," pages 341-342. The New Handbook of the Christian Year by Hoyt L. Hickman and others (Abingdon, 1992; available from Cokesbury). The handbook has the whole narrative (longer and shorter) divided into parts for readers. Avoid typecasting parts such as the pastor reading the words of Jesus. Instead assign parts to the best readers available. Questions for your planning today. Is this a Sunday for a sermon? Maybe, but at least consider letting the participatory reading of Matthew’s Passion be the sermon itself. Personally speaking, I have found the gospel writers to be able to say far more eloquently and completely what needs to be said on this day than any sermon I could write or have ever heard. Is this a Sunday for Holy Communion? Absolutely. This is the day that perhaps the majority of your congregation will experience with intensity the "suffering side" of the paschal mystery unless your congregation has a strong tradition of large attendance at Holy Week services. And in response to the gospel reading of the suffering of Jesus, how can we not offer our Great Thanksgiving and encounter him at Table on this day? Is this a Sunday for baptism or welcoming new church members? Probably not.The United Methodist Book of Worship urges that this be done during Eastertide rather than on this Sunday (see pages 338-339 in the red). But it IS a day for welcoming those you may have been preparing for baptism to walk with you through the experience of Holy Week, and especially the Three Days (Maundy Thursday, Good Friday, Holy Saturday, Easter Vigil, Easter Sunday). Here is a form of prayer you may use this day. The pastor invites candidates and sponsors for baptism or reaffirmation to stand before the congregation, near the font, placed front and center. completing a time of intense preparation for baptism. The pastor extends hands over the candidates and sponsors, and invites the congregation to extend hands toward them in prayer. The congregation may say the names of the persons in bold at the appropriate times. as they continue their journey of discipleship to our Lord, Jesus Christ. in this life, and at the last day. Amen. If we do the processions, and the long reading, and Communion, won’t worship take longer than usual? Yes, it will. And today it needs to. So plan accordingly. Remove elements you do not need—especially announcements and, if you have them, “joys and concerns” times. Move the intercessions into the Great Thanksgiving itself—there are suggestions below for how to do this (See Concerns and Prayers, below). And if you offer multiple services, consider offering at least one less today so there is time in each service for all present to experience and give all this day calls us to offer. And of course, give plenty of notice—both of the lengthier timeframe, and of any alternative starting places for the opening processional you choose to use. But what about those who will say, "When I come to church I don't want to stand around outside and join in a parade!" Invite them to take their seat in the worship space and tell them the service will start outside (or whatever other location) and that the congregation will join them shortly. I’m new here, and this congregation has never done it this way before! Then pray, listen and talk with folks about how much of this you can do this year, and start building a plan to do more of it in succeeding years. Get the shape and basic actions right this year (Processional as Entrance, Passion as Proclamation, Communion, and Sending in Silence) then look at how you can elaborate on each section in the years ahead. We’re a contemporary church. We don’t do “liturgy! "Yes, you do—it’s just a different form of liturgy, assuming it is the work of the whole people and not a stage show! Consider at least adopting the contrasts of festive gathering with Hosannas and your praise band and then moving to the somber rehearsal of the Passion “unplugged.” It will be a powerful juxtaposition. This Sunday, more than any other Sunday in the Christian year, is all about the dramatic encounter between the Word of God in Scripture, the Living Word in our midst, and ourselves as people of the Word. There is more to be read on this day than any other Sunday. So pay particular attention today to who will read and how they will read. Remember the Psalms are not readings. They are prayers. Sometimes, as Psalm 118, they also include cues for liturgical action (as suggested in the form of the processional offered above). So help those who will lead psalms not only read the words, but help the congregation respond and embody these prayer-acts. There is a dramatic shift in tone from the Liturgy of the Palms to the Liturgy of the Passion. Everything in the Liturgy of the Palms is an act of praise. The reading of Matthew needs to be proclamatory and joyful. Surround it with song, or interlace it with call and response. Do not be lulled into thinking this is “just” about the children (several hymns for Palm Sunday have left that impression over the past century or two). In fact, no gospel records of the “entry” scene specify children at all. The notion of children waving palm branches refers not to the Scripture, but rather to substantially later (over 1000 years later) liturgical practices in the Western church. So, if you are seeking to embody the Scripture this day, rather than repeat a traditional practice of one part of the church as if it were scriptural, find ways to include the action of children AND adults throughout both the Liturgy of the Palms and the Liturgy of the Passion. The tone of the Liturgy of the Passion is immediately and drastically different. We shift from victory to victims, from celebration to suffering. While the voice of the crowd dominates in the first movement, here it is the voice of the few who have been singled out to be treated with brutality and respond with both realism and confidence in God. Are there people in your congregation whose own stories resonate with such suffering, who may be asked to lead in the reading of Isaiah or the singing/chanting of Psalm 31 today? Philippians presents a different perspective. This is not the voice of one who is suffering, but rather a description of Christ’s humility and suffering in the context of a culture that highly values the top levels of hits own hierarchy. Consider singing this text rather than reading it. 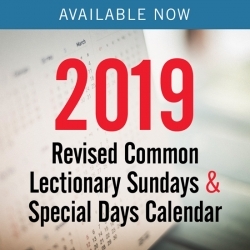 Two versions appropriate for Lent (the third includes Alleluias, and so would be best reserved for another day, such as Christ the King Sunday) are available in The United Methodist Hymnal. Hymn 167 presents it as a responsive canticle with a sung response, and 168 sets the entire passage to music in a minor key, very fitting for the day. The reading of the Passion according to Matthew is the centerpiece and pinnacle of the service of the Word for today (though not of the service overall—let Holy Communion, informed by this reading, take that role, today!). Several suggestions for reading or enacting it have been provided above. Here I only want to suggest that every attempt be made to help this reading be heard in its own drama, and that other elements (sound, video, or drama) not subsume the power of the story told well and including the whole congregation. The full liturgy for this day is on pages 338-343 of The United Methodist book of Worship. What follows supplements that liturgy. Prayer of Thanksgiving: If you will not be celebrating Holy Communion, see page 27 of The United Methodist Book of Worship. However, there are very strong reasons to celebrate Holy Communion — the gospel reading almost demands that having heard this story, we come to receive the very gift of one who died for us. Holy Communion: Use "The Great Thanksgiving for Later in Lent," 62-63, The United Methodist Book of Worship, or "A Service of Word and Table IV," pages 26-31 in The United Methodist Hymnal. Concerns and Prayers: In order not to skip them but to more closely link the gospel narrative (proclamation) and the Eucharist, consider including the intercessions as part of the Great Thanksgiving. For example, if you are using "The Great Thanksgiving for Later in Lent" (UMBOW 62-63), you could insert the concerns and prayers following the epiclesis that ends with "… that we may be for the world the body of Christ, redeemed by his blood." Hear our prayers with your one, holy, catholic and apostolic church, and especially with our sisters and brothers in Japan, North Korea, South Korea and Chinese Taipei, as together all Christians recall your passion for us: Reveal our unity, guard our faith, and stir us up to love's risk and service. Lord, hear our prayer. With all given authority in the nations of the world, that they may be strengthened to work for justice, freedom, prosperity and peace in their lands and in every land. Lord, hear our prayer. With all for whom Christ died and rose again, especially the poor, the unemployed, victims of war or ethnic cleansing, racism and disease. Lord, hear our prayer. With the earth and all creatures with whom we share it, on land, or sea, or sky. Lord, hear our prayer. With all who have commended themselves to our prayers… (the people name those for whom they are praying) Lord, hear our prayer. With all who will be born this day, and all who will die, that, in life and in death, your saving love may be known and your name be praised for ever. Lord, hear our prayer. Then the Great Thanksgiving continues with "By your Spirit make us one with Christ…"
and with the Holy Spirit, one God for evermore. If you choose to combine Palm and Passion themes on this Sunday before Easter, note that you will not be able to do it all. It might be a good idea, as my colleague Taylor Burton-Edwards has suggested, to simply read the lessons for today in their entirety and let the Scriptures speak for themselves. If you do preach, you will need to find a way to transition from the celebratory mood of the procession of the palms to the somber mood of the proclamation of the Passion; and the sermon will need to hit both of these themes. Instead of offering notes on all the readings, I am going to offer a way you might go about achieving this transition should you decide to preach. The Old Testament prophet Zechariah had prophesied that someday Jerusalem would be restored, and when that happened, their king would come triumphant and victorious, but humble and lowly. So just to make sure that no one who read his gospel could possibly miss his intended point that Jesus was the fulfillment of this prophecy, the gospel writer Matthew has it that Jesus sent ahead to Bethpage for BOTH a donkey and her foal, a colt. Matthew says when the disciples brought back this pair of animals they threw their cloaks over them and Jesus hopped aboard —BOTH of them! It says in verse 7, “they brought the donkey and the colt and put their cloaks on them, and he sat on THEM” (NRSV). So I’ve never been sure how Jesus managed to do this. I guess if he could walk on water, he could surely ride two animals at once. But it seems to me that no matter how you look at it, this had to be kind of a funny and strange thing to witness—a kind of comical sight. Maybe the humor helps to soften the blow a little bit. Matthew gives us a complex mixture of humor and sorrow, comedy and tragedy, sweetness and bitterness, face value and deeper meaning, in his depiction of Jesus’ triumphant entrance into the Holy City of Jerusalem. As such, there can simply be no other way to put it: Jesus’ Palm Sunday parade has cross-purposes: On the one hand, there’s the crowd gathered for the festivities, smiling and shouting, “Praise the Lord!” and clapping their hands and having a good old time. The crowd scene represents the joyous and even humorous side of the story, and the joyous side of this day: the Palm Sunday side. It is the part where we’ve got all the regular folks enjoying the fun of the moment, thinking that Jesus was coming to Jerusalem to be crowned as king, and so they joined in the mood of glory and hope, played along, shouted “Hosanna” and waved their palm leaves around like we enact in the processional on this Sunday before Easter. They even took off their cloaks and dropped them on the ground before him, making a royal carpet so that his majesty’s royal feet would not even have to touch the ground! But on the other hand, there is Jesus. He represents the tragedy, the deeper meaning, the incredible, difficult work of God in this world. Jesus. I always wonder what could have been on his mind in this moment? One thing is for sure, and that is, judging by his calculated and deliberate choice of style, fulfilling the prophecy of humility and peace with a tip of his hat even toward being a great entertainer, Jesus was trying to make certain that he would NOT be mistaken for a majestic, earthly king who demanded pomp and ceremony. What must have been on Jesus’ mind that he took such extraordinary steps to avoid the very misunderstanding that led to his trial and conviction? What could have he been thinking about, that beautiful spring day, riding into town on a donkey and her foal while the crowd shouted “ Hosanna to the Son of David! Blessed is the one who comes in the name of the Lord”? We know what was on his mind at Gethsemane, only a few days later, because we know the words of his prayer. We know that he knew by then what was going to happen to him. But did he also know at this point, riding into Jerusalem that first day, that his purpose was to go to the cross? Was he thinking about that as he passed through the crowds? I like to think that if he did know what was coming, that’s not what he was focused on. I like to think that Jesus didn’t spend all his thoughts that day on frets and fears and worries. It seems as if Jesus himself lived with a kind of childlike innocence. So when he said for us to become like little children, he was telling us to follow in the very way that he himself lived. I like to imagine that when the people were singing and shouting and waving those palm branches, that Jesus responded in a simple, childlike way, in an innocent and hopeful way. He wasn’t distracted by his fears and his thoughts about what was to come. He was, like a child, in the moment. Only the greatest of spirits could have managed to do that. Only the most resolute kind of faith would have been able to push back the dark, threatening clouds of worry and fear and enjoy the joy that the day offered, even while knowing what was to come. It isn’t an easy thing to become like a child once we’ve grown up and been exposed to all of the frightening ways of this world. Our natural inclination is to fight fire with fire, to become like the world in order to fight against it. And this is not an easy thing to unlearn, once it has become a part of us. But we have to, because unless we can learn to be like little children, reclaim our innocent spirits in some measure, then we have no chance of entering into heaven now. And if we can’t enter into heaven a little now, then what makes us think that we will be able to fully enter it someday in the future? I just finished reading Proof of Heaven: A Neurosurgeon’s Journey into the Afterlife by Dr. Eben Alexander. While I found his story compelling and challenging in terms of my own beliefs about what happens after we die, I am still not inclined to make that the focus of my faith journey. I believe that Jesus’ teachings about the kingdom of heaven are a roadmap, not just for the life that is to come (whatever that looks like), but rather, for THIS life. Recall that the very first thing that Jesus said when he began his ministry was, ‘Turn away from your sins because the kingdom of heaven is AT HAND. Right here, right now.” When we are baptized, we are proclaiming that we are taking our first step into living in God’s kingdom, the first step in a lifetime of trying to live as kingdom people. Jesus said it very clearly, over and over. Again and again in his teachings, he pointed us toward living as covenant people right here and right now, even in this difficult and frightening, pain- and evil-filled world. Heaven is a miracle, a gift from God to all of us. It is like a mustard seed, tiny and hard to see; but planted in our hearts, it grows into a great tree. In his words and in his life, Jesus scattered those seeds of living among the people he met. Some of the seeds were wasted on rocky soil, on people of shallow character. Some of the seeds were stolen by the evil and deceitful spirit that has a grip on this world. Some of the seeds grew among the weeds of self-centered living and pleasure seeking—those who thought of themselves and felt entitled to their own happiness all the time, even if it came at the expense of everybody else. But some of the seeds fell on the good soil of people who tried to live out love and unselfishness, right here and right now, in THIS world. And their spirits grew and came to flower, and the seeds were passed on, generation to generation, down to you and me. So the possibility of entering the kingdom of heaven has not been lost. The possibility of living as kingdom people and practicing the gospel of love and forgiveness and innocence, of being born again as a child, is still a very real option that is available to each one of us. No matter how old we are, no matter where we’ve been or what we’ve done, no matter how far we have strayed from the ways that Jesus taught, no matter how full of doubts and fears and cynical worldliness we are, the invitation still stands. We can start it all over and become like little children once more. But unless we are open to letting God work a change in our hearts, unless we are willing to become like little children, the seeds of goodness and justice and mercy and true joy will not be able to grow in us. Choked as we are by all of our distractions and tranquilizers—our cars, our houses, our 60-inch televisions and 6-inch computers, our smartphones and gizmos and gadgets, all of our conveniences and drugs and entertainment—we are likely to lose sight of the gate into heaven. Just as Jesus, entering Jerusalem while the palms waved and the people greeted him with shouts of acclaim, might have allowed himself to become distracted, might have taken his eyes off of his humble purpose with the cross waiting at the end of it, and allowed himself to instead become caught up in the desire for worldly power and prestige. But when I think about Jesus that day, I really believe that he never, even for a second, lost sight of heaven. I believe he kept his gaze straight ahead and didn’t waver a bit. The crowds might have roared like the fans in the stands in Sochi, and the band might have played “Hail to the Chief,” and the devil might have whispered in his ear and said, “Come on, man. You can have it all: power, money, fame. Why should you suffer and die? You can have it all, Jesus. You can outsmart those Jewish leaders, and even old Herod. You’re much wiser than he!" But I believe, in fact, I am CERTAIN, that those were not the temptations and thoughts that occupied Jesus when he rode into Jerusalem while keeping his difficult balance on the two animals at once and his eyes on the cross. I believe that his faith was firm and unwavering, and that his spirit was untroubled and innocent and childlike. I believe that, because I know how the story ends, and I’ve seen enough people try some of those other paths—heck, I’ve tried some of them myself—to be able to say that I really believe that becoming like a child is the ONLY way to make it safely through the crowd. Life is full of temptations and struggles. It’s full of dark days and hard times. It’s full of pain and suffering and deathly ways. It’s full of grief and sorrow and woe. We know that. It’s hard to keep our eyes focused on heaven. It’s hard to not be distracted by all of these other things. It’s hard to become like little children. How do we turn our eyes upon Jesus when there are so many other things to tempt us? By following the way of Jesus. And the way of Jesus Christ is to stay focused on the cross: to keep walking toward it and not let ourselves be distracted, either by the noise of the crowds outside or by the voice of our fears inside. The way of Jesus Christ is the way of the cross. It’s the way of staying the course, keeping the faith, and moving steadily toward heaven, even when the crowds are roaring all around, and the temptations of the world beckon, and the alternative looks a whole lot better for a moment. It’s the way of childlike innocence, of not getting distracted, of walking not just to the cross, but PAST the cross, all the way to heaven. Today is the start of Holy Week. Holy Week is in some ways a metaphor for our whole lives. It is a ritual of walking through the pain and suffering of our Lord, and being reminded that to be his disciples means that at times we will have to make that walk ourselves. So we walk with Jesus through his moment of triumph amid the crowds waving palms, and we walk with Jesus through his grief over Jerusalem, and we walk with him as he shares a final meal with his disciples, and we walk with him as he washes their feet, and we walk with him through his trial, and through his conviction, through his crucifixion on the cross, through his suffering, and through his death. We walk with him just as he walks with us through our moments of triumph amid crowds waving accolades, and he walks with us through our times of grief and sorrow, and he walks with us as we share final meals with our closest friends, and he walks with us through our trials, and through our convictions, and through our suffering, and through our death. Today we walked with him through that shouting crowd, and we considered how he kept his faith in the midst of a very bittersweet moment. We were reminded in Scripture of how difficult his journey became as we read the story of his final moments on the cross. Through Christ, we learn to walk with courage and innocence through our own painful moments and to keep moving toward the kingdom of heaven. For Christians, there is no real understanding of the joy of Easter without knowing the sorrow of Good Friday. The triumph of Palm Sunday has a cross purpose, because there is no Resurrection celebration without first facing the cross. Who is he who comes in triumph?